Not everyone on Facebook is who they claim to be. And while some of the fake info posted on the world's biggest social network is nothing more than a bit of harmless bragging, some of the fakers can be downright dangerous. Enter FB Checker, a free application that is designed to help you identify fake Facebook accounts. Add up to five photos to FB Checker for analysis. FB Checker is free. All you have to do to get started is download it and give it permission toaccess your Facebook account. Then, when you come across a Facebook profile you'd like to verify, you launch the app from your system tray. FB Checker works by analyzing photos, so you have to click on a few photos from the account in question to add them to FB Checker. This can be tricky if you haven't accepted a friend request from the account in question and have limited access to their photos, or if the account simply doesn't have that many photos posted. FB Checker works by analyzing the photos you select, and then searches for duplicates on the Internet. If the photo isn't found on another site, FB Checker believes it is legitimate, but if it is found elsewhere, FB Checker then analyzes that site to see if the photo has the same name attached to it. (This prevents it from identifying photos of celebrities and other public figures as fake simply because they're widely used.) FB Checker labels accounts as fake when a photo is found on several different Web sites, without the name associated with the Facebook account. The application presents its findings to you in a neatly organized graph that makes it easy to see where on the scale it falls. The problem lies with the fact that FB Checker relies solely on photos. 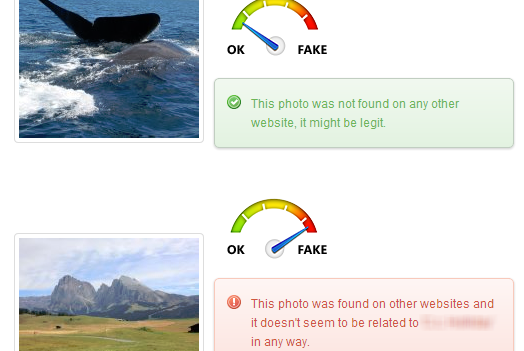 Sure, some users may grab fake photos and use them to create a phony profile for nefarious purposes. But the truly dangerous criminals may be a bit smarter, using photos that could be real, and more likely to fool an application like FB Checker. FB Checker was able to identify a few fake accounts for me, but these were accounts I'd already labeled as fake myself. It was unable to identify two fake accounts that were more subtle, though…both of which were created by users who wanted to hide from folks on Facebook. That makes me reluctant to rely on FB Checker to find the real fakes on Facebook. FB Checker helps you identify fake Facebook profiles, but your common sense should work just as well.